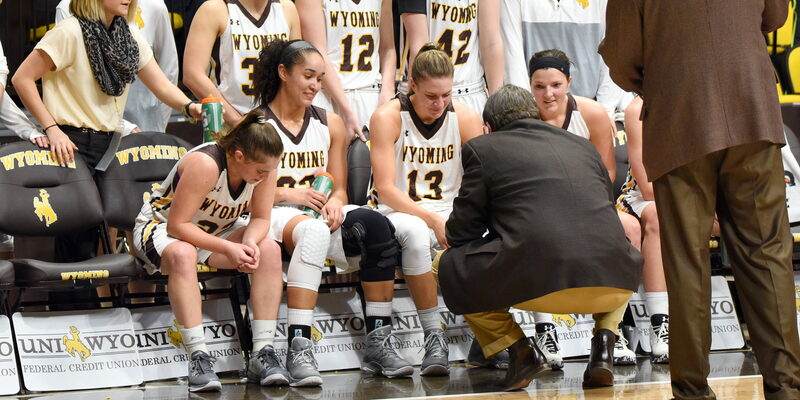 The Wyoming basketball team (14-6 overall, 7-2 MW) had its seven-game winning streak snapped with a 64-53 loss against the Colorado State Rams (15-7 overall, 7-4 MW) on Wednesdaynight. Senior Liv Roberts finished her night with a team-high 18 points, plus four rebounds, two assists and steals. She also reached 1,000 points for her career, becoming the 24th player in school history to achieve that mark. Sophomore Taylor Rusk followed with ten points. As a team, the Cowgirls shot 17-of-47 (.362) from the field and 6-of-20 (.300) from beyond the arc. Redshirt senior Hannah Tvrdy recorded a game-high 25 points and eight rebounds. She was followed by redshirt freshmen Liah Davis and Jordyn Edwards with 12 points each. The Rams were 27-of-54 (.500) from the field and 5-of-14 (.357) from beyond the arc. CSU out rebounded the Cowgirls 32-26 and had 36 points in the paint. Colorado State got on the board first with an early three by junior Sofie Tryggedsson. Free throws by Roberts put the Cowgirls in the scoring column. The Rams scored six of the next eight to extend the lead to five, 9-4. UW made a small run to cut it two, 11-9 through the first media timeout. Both teams each scored a basket to close out the period to make it 13-11 after one. After a basket by the Rams, Wyoming made a small run to take it its first lead of the game, 16-15. CSU extended it back to a four point lead, 20-16, but a basket by Rusk ended a three-minute scoring drought by UW. The teams combined for 15 points the rest of the way as the Rams took a 28-25 advantage in to the locker room. The Cowgirls came out a little stronger in the third quarter by going on a 7-2 run capped off by two free throws by Roberts to give her 1,000 points for her career and the lead 32-30. Colorado State responded by scoring the next seven of eight to pull ahead by four, 37-33. Wyoming battled back to take tie it up at 39 and eventually took the lead 43-42. Started by a last second shot, the Rams scored the next 12 straight to give CSU a double-digit lead, 54-43, with six minutes on the clock. A three by Baker would stop the scoreless stretch for the Cowgirls and started a 10-4 run to cut the lead to five, 58-53. Unfortunately that would be as close as it would get as Colorado State scored the final six points to win the game by 11, 64-53. The Cowgirls return to the road on Saturday to face the Fresno State Bulldogs. The game is set for 3 p.m. MT at Save Mart Center in Fresno.